December 31, 2014: The Heartfile-hosted Pakistan Health Policy Forum features commentaries, resources and updates about Pakistan-specific health and population-relevant systems issues. View some of our recent posts which relate to the World Diabetes Day, the International Conference on Nutrition, in Rome, Italy in November 2014 and the 2014 World Economic Forum’s Summit on the Global Agenda. Also featured this month is a story from Heartfile Health Financing, which narrates the plight of Tabinda, a gunshot victim, supported through the program. Plunged in the corner of an orthopaedic ward in a hospital in Pakistan, ZU, a 19-year-old labourer struggles with pain and discomfort, his leg arched over a metal frame at 45 degrees. Two bricks hang from a cord tethered to a nail stuck deep in his lower thigh, preventing the fracture he sustained a week ago from misaligning. Every now and then he gazes at the door to see if his brother is back from the village with the money needed to fix his leg. The only goat they possessed had fetched half the amount needed to buy a surgically implantable nail, necessary to cement the bone. His brother had now gone back to the village to borrow the rest. He wonders if his fate will be the same as that of the man at the far end of the ward, who was taken back home in a similar situation after ten days in the hospital after his family was unable to buy the surgical implant needed to fix his fracture. ZU stares at the Rs5000 he had borrowed from his employer the day the trolley ran over his leg, haunts him. He gazes at it in his palm and struggles with a decision – should he keep it for medicines, which he would need in addition to the expensive nail or should he send it home. He grapples both with emotional and physical pain. This is not a unique story, but a usual story of financially poor patients visiting public hospitals in Pakistan. It is a dilemma millions of families in the country face; they are either forced to sell assets, relinquish basic needs, or fall into debt if they have to secure treatment for their loved ones. In the process healthcare costs become economically catastrophic. Many simply forgo healthcare. We recall the suffering of such patients now, since December 12 was the World Universal Health Coverage Day. Pakistan’s political rhetoric heavily exploits the notion of a welfare state as a national aspiration. It must be recognised that universal health coverage is at the core of the concept of a welfare state. One of its goals is to ensure that people have financial access to healthcare and that they are protected from catastrophic health expenditures and medical impoverishment. So how can the government ensure that people like ZU and millions like him get the help they deserve in time – and at the moment of their greatest financial need? In order to answer this question we must understand where poor people seek healthcare when they have a critical healthcare need, what is available to them and where the gap lies. Financially disadvantaged people like ZU are likely to come to government hospitals when they fall critically ill. Their faults notwithstanding, large government hospitals are the only hope for poor people and the throngs that we see there are proof of that fact. Once in hospital, someone like ZU does not have to pay a hospital or doctor’s fee. The major cost incurs to the patient’s family when surgical disposables, implants or expensive medicines and diagnostic tests are required. At that point, patients can either seek help from the Bait-ul-mal or the hospital itself can provide the needed medicines and surgical supplies if they have already been procured and are available on the shelf. This system of support should work well for poor patients. Why do patients like ZU suffer then? Because in reality these systems don’t work well at all. First, hospital budgets are often not enough to procure and make readily available everything needed by patients like ZU. Demand is very high due to the high population pressure on hospitals, and in many cases, corruption and pilferage compromises the already limited resources. Second, the Bait-ul-mal is not effective in the given context. Its funding is unpredictable, it is hostage to patronage and collusion is entrenched, as a result of which there are false inclusions and false exclusions. Only a fraction of those who apply are successful and help generally comes very late. By that time many patients have already taken a loan or sell an asset, a goat, a cow, trinkets, etc. Many are also taken away from the hospital because families cannot secure the funds. The solutions to the financial access problem of the sort faced by ZU are therefore simple but difficult to implement. One, increase and transparency in the use of hospital budgets so that medicines and surgical supplies can all be made available on the shelf in hospitals. Second, a revival of the Bait-ul-mal, making its coverage larger, more predictable and available in all hospitals ensuring that there are no false inclusions and exclusions. There are examples of successful pilot proogrammes where effective use of technology and cell phones has made Bait-ul-mal-like programmes transparent and responsive. These can be scaled up. There is a long list of needed reform measures in the health sector, but at the barest minimum, it is the state’s responsibility to create effective social protection for health. If our governments can develop systems to help people like ZU, a major milestone would be achieved. December 09, 2014: An International Seminar on Public Policies Against Childhood Obesity and Overweight was recently held in Mexico City. 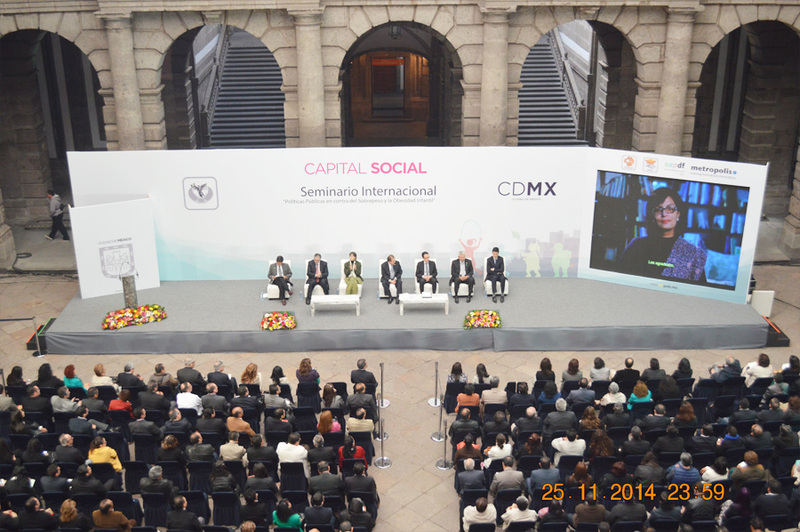 The event was hosted by the School of Public Administration of Mexico City (EAPDF) and the Regional Center for the Americas of the METROPOLIS International Training Institute (MITI). Our President, Dr. Sania Nishtar was the Keynote speaker at the event. Her talk was relayed through a video link and was simultaneously translated in Spanish. The video relay can be viewed here. December 8, 2014: Heartfile was invited by the World Health Organization, Western Pacific Regional Office for a Technical Consultation on Models of Innovative Financing for Eye Health in Manila, Philippines on 2-3 December 2014. 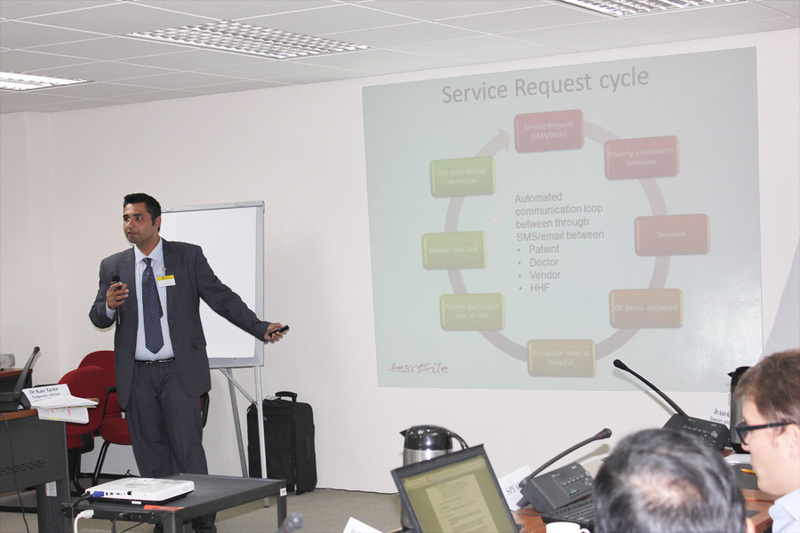 Heartfile Health Financing, an mHealth enabled social protection system was presented by Dr. Anis Kazi at the meeting.